One afternoon in September of 2011, a few months after returning to the Hilton Head Island from my “victory lap” year at Auburn, my buddy John Cranford called me up and asked if I could come jam with him at the Big Bamboo. When I arrived that evening, I was introduced to a left-handed bass-playing gourmet chef named Phil Sirmans and a mohawked drummer named Randy Rockalotta. At the time, I don’t think any of us had the slightest idea what we were getting ourselves into; but by the end of that first show, we all knew there was something very interesting going on. In the first six months, we recorded an album and began performing almost constantly around the Lowcountry. We were fortunate to have a lot of support from local media (including the fine folks at CH2 magazine, who ran a story on us right off the bat), our families, friends, and girlfriends, and from island society in general. I know I can speak for all four of us when I say that we couldn’t have done it without y’all. Over the past four years, we’ve been trying to steadily expand our area of operations. A big step up came in the fall of 2013, when we partnered with Rocky Mountain Artists, a booking agency based in Denver, Colorado. Almost immediately, they put together a tour that took us to 14 new markets in Colorado, as well as a few on the way out there. One town in particular really tugged at our heartstrings more than any other. Telluride, Colorado is situated at an elevation of almost 9,000 feet on the banks of the San Miguel River, which comes tumbling down from the peaks of the San Juan Mountains that tower over the town on three sides. Despite the obvious differences in natural scenery, Telluride shares much in common with our Lowcountry home. Its foundation as an outpost of gold and silver mining in the late 1800s echoes the Sea Islands’ history as a home of cotton and indigo plantations, which began two centuries earlier. 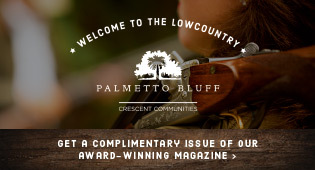 Like the Lowcountry, it was a remote and lawless place for much of its history. And like Hilton Head Island, Telluride’s potential to become a world-class resort destination was discovered and nurtured in the mid-20th century. The venue we found ourselves in was almost as mind-blowing as the town. The Fly Me to the Moon Saloon sits in a basement below a restaurant on Telluride’s main drag, Colorado Avenue. The saloon features stone walls, low ceilings, and an enormous bar that runs the entire length of the venue. Legend has it that springs were built into the dance floor. A gigantic mirror near the stage is painted over with an impressionistic, almost surreal scene of Earth from the moon, making the viewer feel like Neil Armstrong on acid. Outfits like Widespread Panic, Phish, The String Cheese Incident, and Leftover Salmon have performed on that cavernous stage. At our first Moon show, we were introduced to the unbridled enthusiasm these mountain folks have for live music, and we would be welcomed back for Fourth of July and New Year’s Eve concerts in 2014 & 2015. We developed a rapport with the resident sound engineer, Preston Havill, and by the fall of 2014, Preston invited us to put down some tracks at Studio in the Clouds, a massive facility on the Hastings Mesa about 10 miles west of Telluride. With the help of Ellowyn Kane, an energetic, soulful young singer-songwriter and Telluride native, we went to work in early January of 2015. 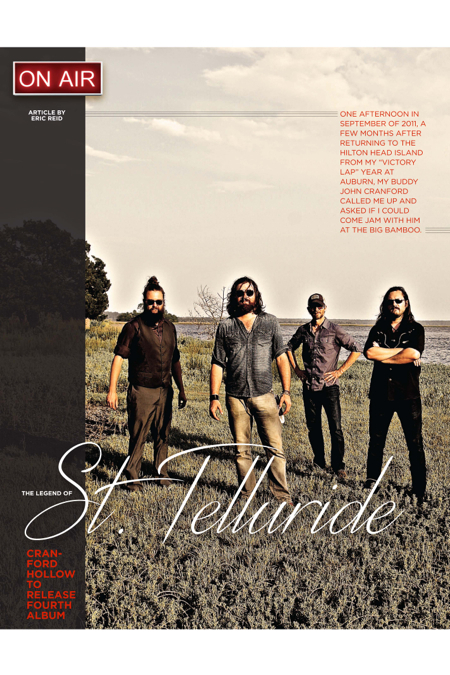 After four days on the mesa, we had a solid foundation of the record that would become St. Telluride. To finish the album, we returned to our roots, so to speak. Back in 2012 Randy had put us in contact with a producer named Jim Devito. He had worked with Devito in his days as the drummer for North Florida rock band Spider Monkey. Devito owns and operates Retrophonics Studios, just across the street from the beach in St. Augustine, Florida. Our first record, the Crescent Beach Sessions, and our third, Spanish Moss and Smoke, were produced entirely at Retrophonics, and it didn’t take a lot of thought to decide to finish our fourth album there as well. Devito’s studio is, in itself, a magical place, crammed full of vintage amps, rare guitars, and priceless microphones. We spent a few weeks over the course of the spring locked in at Retrophonics, trying to layer some substance on the foundation we had begun on the Hastings Mesa. The songs, while stylistically diverse, all seem to fit together within a common framework. Fans will recognize some of the new numbers from our live shows, as we’ve been playing songs like “Pushing Pain” and “Breakdown” for months, if not years. John and Ellowyn collaborated on “She Gone” and “Run and Hide,” and we were fortunate that she could take a day this spring to make the short trip up to St. Augustine from Orlando, where she is studying at Full Sail University. Phil busted out his finest quill and parchment and contributed such tunes as the psychedelic, introspective “Without a Word,” the hard rocker “Devil in Disguise,” and “Broken Cigarette”—a tale told from the dual points of view of a bartender and one of his worse-for-wear patrons. This month, we’re getting ready to release the culmination of these past seven months, our fourth studio record, St. Telluride. Because it is our fourth, and in order to provide a greater opportunity for all our fans around the Lowcountry to be a part of its release, we will be hosting four separate album release parties. The first of these will be an intimate acoustic show at the Chapel at Palmetto Bluff on Thursday, August 13. The next evening, we will be playing a full rock show on the beach at the Tiki Hut, reminiscent of our performance there this past Memorial Day. On Saturday, August 15, we will be throwing a party from the deck of the Delta Lady out at the sand bar on the May River. Finally, on Sunday, August 16, we will be performing at Freeport Marina on Daufuskie Island in conjunction with the release of the latest novel, The Mullet Manifesto, by Roger Pinckney, one of our favorite authors and one of our favorite guys to hang out with. I really hope all of y’all can be a part of this amazing weekend. Thank you for all of your support, and I hope to see you at a show!